‘Tis the season to be jolly and Prairie Grass Cafe (601 Skokie Blvd., Northbrook, IL 847-205-4433) is the perfect place to enjoy a festive holiday meal. The popular Northshore restaurant will be open from 9:30 a.m. to 2 p.m. for Sunday Brunch and from 5 p.m. to 7:30 p.m. for a special Christmas Eve dinner. Prairie Grass Cafe will be closed on Christmas day. On Christmas Eve, in addition to its regular full brunch menu, Prairie Grass Cafe will offer two comforting brunch specials that perfectly capture the Christmas spirit. The Homemade Maple Sausage Benedict ($12.50) satisfies savory cravings while the second special, a Warm Cranberry Pecan Coffee Cake drizzled with sweet butter sauce ($6), is the perfect treat for those on Santa’s nice list. Favorites from the regular brunch menu include the Local Omelet ($11.50), with farmer eggs, River Valley Ranch mushrooms, and Capriole Farm goat cheese; Lemon Ricotta Pancakes with maple syrup and whipped butter ($12) or topped with raspberry sauce and Crème Anglaise ($17); and the Signature PGC Benedict ($12) of two poached eggs over sautéed spinach, crumbled bacon, an English Muffin and topped with roasted tomato hollandaise sauce. Reservations are highly recommended. Please call (847)205-4433 to make yours. For Christmas Eve dinner, a handful of wonderful specials will accompany the restaurant’s fulldinner menu . 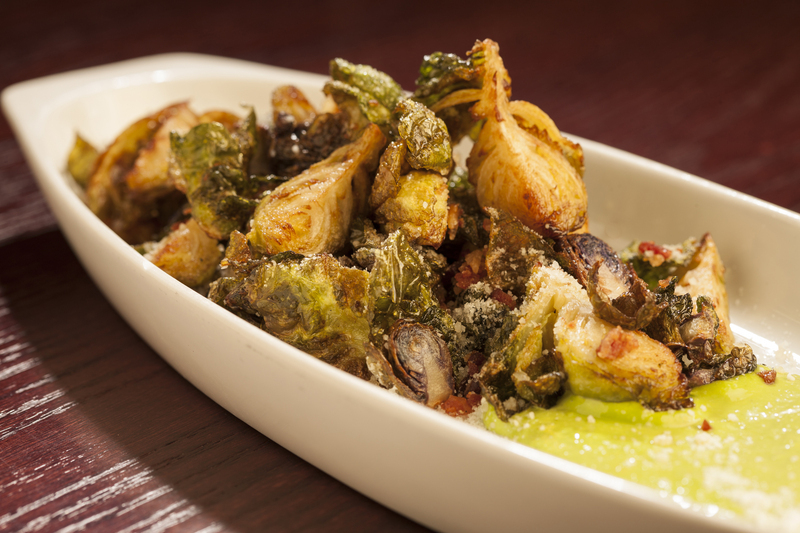 Inspired by the season’s local produce, dishes include the delicious Heirloom Squash Soup ($6); Crispy Brussels Sprouts ($12) with local bacon, chestnuts and cranberry remoulade; and Sea Bass with River Valley Ranch mushrooms, parsnips and pomegranate seeds ($36). 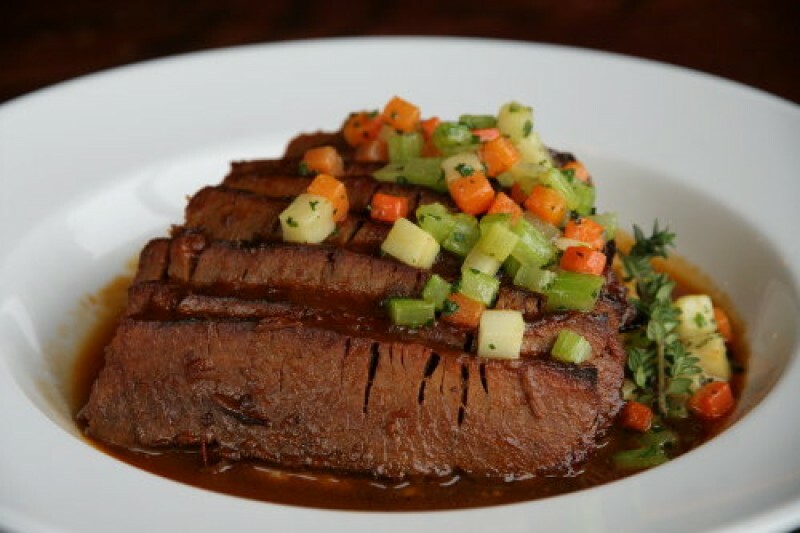 Those craving something hearty will savor the BBQ Braised All-Natural Brisket served alongside roasted cauliflower ($26). Complete a perfect Christmas Eve feast with a delicious dessert. Prairie Grass Cafe will be serving a special Pear Financier ($10), poached pear baked in almond cake, for a slightly sweet and totally satisfying treat. Other desserts from the regular menu include the popular Double Chocolate Cake ($8.50), Sticky Toffee Date Cake with Vanilla Ice Cream ($9), and the signature Warm Chocolate “Muk Muk” with Crème Anglaise ($8.50). Reservations are filling up quickly. Call (847) 205-4433 to save your table. Need a Last-Minute Holiday Gift? Give loved ones, friends, coworkers and anyone else the gift of a wonderful dining experience with Prairie Grass Cafe gift cards. Available in any amount, they are a perfect taste of holiday cheer. Whether you're enjoying New Year's Eve with family or friends, a trip to Prairie Grass Cafe is a perfect way to celebrate the end of 2017. Start early at Prairie Grass Cafe's delicious brunch, 9:30 a.m. to 2 p.m. or enjoy an early celebration dinner from 5 p.m. to 8 p.m. In addition to the regular menu, a handful of New Year’s Eve specials will be offered. Reservations are recommended. Prairie Grass Cafe will be closed New Year's Day. Prairie Grass Cafe (601 Skokie Blvd. ; Northbrook, IL; 847-205-4433), co-owned by chefs Sarah Stegner and George Bumbaris, supports Chicago’s Green City Market and local sustainable farms, selecting the freshest ingredients to reflect the season. Prairie Grass Cafe currently serves lunch Monday - Friday 11 a.m. to 2 p.m. and dinner Monday through Sunday. Dinner is served Tuesday - Thursday from 5 p.m. to 9:30 p.m., Friday and Saturday from 5 p.m. to 10:30 p.m., and Monday and Sunday 5 p.m. to 9 p.m. Prairie Grass Cafe also serves breakfast Saturdays 10 a.m. to 2 p.m. and Sundays 9:30 a.m. to 2 p.m. Light fare is available in the bar Monday through Friday, 2 p.m. to 5 p.m. For more information or to make a reservation, please call (847) 205-4433 or visit prairiegrasscafe.com. 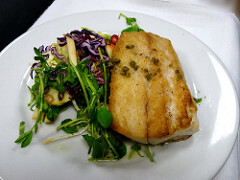 Follow Prairie Grass Cafe news at newsline360.com/prairiegrasscafe and on Facebook at Facebook.com/PrairieGrassCafe. In this week's Top 10 homes spotlight at TopTenRealEstateDeals.com, we take a look at the best celebrity homes that were on the market in 2017. Throughout 2017, many of the world's superstars tried to sell their glamorous mansions and compounds. From Beverly Hills to Florida and New York City, there was a celebrity property for almost anyone who is extremely wealthy. America’s #1 sweetheart, Taylor Swift, is one of the world’s richest celebrities with estimated career earnings from her music, concerts, acting and endorsements approaching $800 million. What to do with all that money? Taylor has invested much of it in real estate with homes in New York City, Rhode Island, Nashville and her most recent purchase of Samuel Goldwyn’s mansion in Beverly Hills. Included are a library-screening room, a guest suite with a private entrance on the home’s main level, a library, card room, gym and an additional private guest apartment above the garage. The master suite has a veranda that overlooks the city lights. Outside is a swimming pool and pool house with kitchenette and sunken tennis courts. Goldwyn (1879-1974) founded award-winning Goldwyn Pictures and Samuel Goldwyn Productions - now known as Metro-Goldwyn-Mayer with the famous roaring lion head logo. In recognition of Goldwyn’s historical contributions to the film industry, Taylor sought and achieved landmark status for her new home to ensure its preservation for future generations of movie fans. Her home is now an official Beverly Hills city landmark. Since purchasing the home in 2015, Swift has worked closely with architects to bring the estate back close to its condition that existed in 1934 when it was built for Goldwyn and his wife, Frances. The home was a neighborhood destination for many of the era’s Hollywood stars including Clark Gable and Charlie Chaplin and used by Sam as collateral for several of his films including Wuthering Heights and his 1946 Oscar-winner The Best Years of Our Lives. After he died in 1994, the home stayed in the Goldwyn family for over 80 years until Taylor purchased it from the estate of Goldwyn’s son for $25 million. Ellen DeGeneres is well known for her endless energy dancing up and down the aisles of her TV show studios, headlining numerous Hollywood award shows and her frequent charity work and performances. In her spare time, Ellen is by far the #1 celebrity home flipper leaving her competitors such as Jennifer Aniston, Meg Ryan and Diane Keaton in the leftover construction dust. Ellen and her wife, Australian–American actress Portia de Rossi’s latest real estate investment and a predominant subject in Ellen’s book, Home, is an expansive house and grounds on a Montecito, California hill overlooking the ocean and mountains and also next door to Oprah. Known as “The Villa,” it was designed by noted architect Wallace Frost after returning from Italy. Entranced by 17th-century Italian villas, this was the home he envisioned and built for himself and his family, which he replicated with great accuracy. Ellen and Portia purchased the estate in May 2013 for $26.5 million and expanded it through the acquisition of two adjacent properties, which now totals 16.88 acres. The 10,500-square-foot home includes six bedrooms, eight baths, nine fireplaces, multiple libraries, a marble-wrapped chef’s kitchen and formal rooms. An indoor-outdoor entertaining pavilion was built from stone excavated on-site with hand-made iron windows. The couple also added a lap pool, sunken championship tennis court and installed state-of-the-art irrigation, mechanical, electronic and security systems. Suzanne Perkins of Sotheby’s International Realty in Santa Barbara, California is the listing agent. Ellen’s 1930’s Italian villa is for sale; originally priced at $45 million, it has been reduced to $39.5 million. Unequaled late-night talk show host Johnny Carson was a standout among entertainers, to which his 30-year longevity on air is testament. Though three preceded him in the genre: Arthur Godfrey, Steve Allen and Jack Parr, it was Carson who became - and still is - the icon of late-night talk shows. He sent Americans to bed each night with a smile on their faces and was instrumental in boosting the careers of many entertainers we still enjoy today including Jerry Seinfeld, Ellen DeGeneres, Roseanne Barr, David Letterman and Jay Leno. After he moved his show from New York City to Burbank in 1972, Carson loved to play golf and for a number of years owned a home in Bel Air. However, in the mid 1980s he bought a four-acre, cliff-top home above the celebrity-studded Point Dume community in Malibu overlooking the Pacific Ocean where he lived with third wife, Alexis, until his death in 2005. The house, designed by architect Ed Niles, is a study in wood beams, glass and indoor landscaping that blurs the line between indoors and out. On the grounds are championship tennis courts with a pavilion that has two bedrooms, kitchen, gym and locker room, a waterfall and koi pond, and another separate guest house. After Carson’s death in 2005, Alexis continued to live there for two more years before selling to film producer Sidney Kimmel and his wife, Caroline. The Kimmels restored it to its original plan and have recently put it on the market for $81.5 million. Chris.Cortazzo of Coldwell Banker, Malibu West, California is the listing agent. Futuristic even for today, the mid-century-modern round house is on the market with walls of glass overlooking a secluded pool terrace and views of the Santa Rosa Mountains and the Coachella Valley. The 5,000-square-foot house has five bedrooms and five baths and comes with 1.16 acres of land with private garden, tennis court and orchard in addition to the swimming pool. Mary Kay Nibley of Rodeo Realty, Beverly Hills, California is the listing agent. Now for sale at $5.9 million, the House of the Future is also well-known as the honeymoon hideaway of the King of Rock ‘n Roll which he leased in 1966-1967. Even though she was the first lady for less than three years, Jackie Bouvier Kennedy is one of the most famous of the presidents’ wives. After spending her early years in the New York area where her father, John “Black Jack” Bouvier, was a stockbroker, Jackie’s mother, Janet, divorced John in 1940 and two years later married Standard Oil heir Hugh Auchincloss. The marriage precipitated a move to his home in McLean, Virginia when Jackie was 13. The divorce had been hard on Jackie and it seemed to make her withdraw into herself. After moving to McLean, she found solace in the home’s location with its panoramic views over the Potomac River and the lushly landscaped seven acres she enjoyed exploring. The 23,000-square-foot, four-level, brick-and-limestone mansion with its nine bedrooms and 13 baths was built in the classic Georgian style. Outside are terraces for dining and entertaining with full outdoor kitchen along with various long established vegetation-enclosed garden rooms along with a terrace overlooking the river. Grounds include a tennis court, indoor swimming pool with separate gym and changing rooms and an outdoor swimming pool. Jackie slowly started to blossom at Merrywood and attended George Washington University in Washington, D.C. After college, she went to work for the Washington Times Herald as a roving reporter. In 1952, she met Congressman John F. Kennedy and they were married in 1953 after he had been elected as United States senator from Massachusetts. Living at Merrywood was the catalyst that put Jackie Kennedy in the right place at the right time to eventually become the 35th first lady of the United States. Historic Merrywood estate, home of Jacqueline Kennedy Onassis during her teen years, was listed for sale asking $49.5 million in June 2017 and sold in July 2017 for $4.25 million. From Vogue cover model, dance teacher, acclaimed Hollywood and Broadway actress and war protester to selling over 17 million exercise videos, Joan Fonda shows no signs of slowing down. She has owned and lived in many beautiful homes over the years from her New Mexico ranch where she lived in jeans and cowboy boots to her sleek and sophisticated home in the Beverly Hills Trousdale Estates which she put on the market in 2017. The 7,100-square-foot home’s glass walls, glass elevator and multiple covered and open terraces create indoor/outdoor living spaces to enjoy sweeping canyon and ocean views. Though very sophisticated in its contemporary design, the home is warm and inviting with multiple spaces for entertaining. In addition to the outdoor viewing pavilion with fire pit, there is yet another special place - the meditation garden. Listing agents are Jade Mills and Valerie Fitzgerald of Coldwell Banker Previews International in Beverly Hills. Jane Fonda’s stunning contemporary home in Beverly Hills overlooking a canyon and Pacific Ocean originally listed at $12.995 million has been reduced to $9.995 million. Since the 1920s after Douglas Fairbanks and Mary Pickford built their Pickfair Mansion in the new town of Beverly Hills, many of Hollywood’s top stars chose the area for their trophy homes. One home on Delfern Drive attracted more than its fair share of celebrity owners including Audrey Hepburn and Eva Gabor. Located in the celebrity-infused neighborhood of Holmby Hills, the 7,000-square-foot traditional mansion is accessed through a gated entrance down a paved drive to the motor court. The private compound includes over an acre of lawns, tennis court, swimming pool, terraces, a 700-square-foot guest house with kitchen and a detached 1,000-square-foot staff quarters/office with living, dining, kitchen, one bedroom and two baths. The main house, originally built in 1938 and designed by popular architect-to-the-stars Paul Williams, includes a grand foyer with focal curved stairwell, formal living room with fireplace and dedicated library nook, dining room, family room, kitchen, breakfast room and two staff bedrooms on the first floor. Upstairs are four bedrooms, including the master suite, totaling six bedrooms and four baths. Some rooms have glass walls overlooking mature gardens. Not surprisingly, the house also had a strong attraction to other stars of the era who lived there including David Niven and Mia Farrow. The listing agent is Jade Mills of Jade Mills Estates through Coldwell Banker Global Luxury, Beverly Hills, California. Traditional Los Angeles Holmby Hills legendary gated estate once belonging to Audrey Hepburn and Eva Gabor and other top movie stars is for sale, priced at $13.995 million. From a jock hangout to one of the most sophisticated and dramatic apartments in New York’s Soho neighborhood, interior designer and actress Meg Ryan used her remodeling talents for a beautiful transformation. Having purchased the bachelor pad from The Simpsons Hank Azaria in 2014, Meg had the ability to visually block out the massive gym, animal skins thrown over dining room chairs, too much 70’s shag carpeting and imagine how rooms could be repurposed and restructured. She identified the bones and how they could be adjusted to get the best flow for today’s lifestyle. Encompassing a full floor of a converted Soho warehouse, the 4,100-square-foot loft co-op has three bedrooms, three baths and is accessed by a key-lock elevator. Some of the pre-war details include a long entry gallery bathed in light from the large windows spanning the space, seven architectural columns, 12-foot ceilings and floor-to-ceiling French doors. After being completely gutted and built out, Meg went with a sophisticated city theme of dark color, contrasting textures and a glass wall with French doors between the living room and dining room. Brick walls were left exposed in the media room. The new open and airy kitchen is stocked with high-end appliances and leans toward more French design. Meg Ryan, America’s sweetheart in When Harry Met Sally, Sleepless in Seattle, You’ve Got Mail and director of Fan Girl and Ithaca, put her elegant Soho loft on the market for $10.9 million. It sold a short time later for $9.85 million. Blond bombshell, pin-up girl, close friend of the Kennedy men and highly successful actress, Marilyn Monroe, starred in many of the 1950’s and early 60’s biggest box-office hits including Some Like It Hot, Gentlemen Prefer Blondes and The Misfits. Proceeds from her films, which grossed over $200 million, would have afforded her the ability to buy almost any home her heart desired. However, she purchased only one house in her own name during her 36-year lifetime when she bought a home in the Brentwood neighborhood of Los Angeles in early 1962 - just a few months before her overdose death from sleeping pills. She paid $75,000 for the partially furnished home; her mortgage payments were only $320 a month. After going on the market almost four years ago, the Florida waterpark home built by Celine Dion and her husband, Rene Angelil, has finally sold. Celine and Rene, now deceased, purchased the five-acre lot in Jupiter, Florida in 2008 for $7 million and began building the house in 2010 which includes 13 bedrooms, 14 bathrooms and golf simulator within its 20,000 square feet. The Bahamian-inspired mansion is open and airy with multiple glass walls for viewing the property and includes a tennis court and guest house. The lavish pool system requires 500,000 gallons of water and includes two swimming pools, two water slides, a lazy river, water cannons and a tree house. Gaining much notoriety over its massive water park feature and over 400-feet of Atlantic Ocean white sand beachfront, it was initially introduced at $72 million in 2013 and went through several price cuts from $72 million to $62.5 million to $45.5 million before its final reduction to $38.5 million. It sold in 2017 for $28 million. Visit TopTenRealEstateDeals.com for 2017's Top 10 Celebrity Homes and for more historic, famous and spectacular homes. Celebrity home photos and descriptions with agent permission to reproduce available at: http://bit.ly/toptenmedia. "Last-Minute Gift Ideas for Chicagoans"
1. An online gift card to walking tours of interior architecture or historic bars, downtown and in Chicago neighborhoods. 2. Tickets for our "Holiday Tour of Drinks, Daleys and Dead Guys"
As gift-buying season winds to a close, the procrastinators can still instantly get a special gift by purchasing a Chicago Detours gift card online, and then printing out the details and tour images. Chicago Detours can still send the cute little print cards, but cannot guarantee that the Chicago postal system will deliver in time for Christmas! 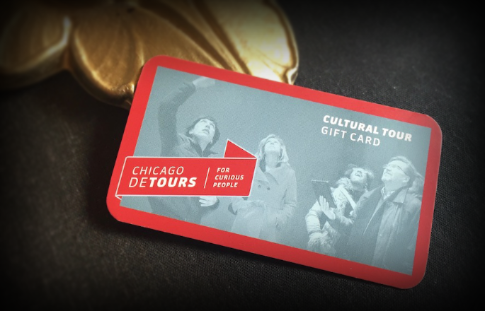 Gift card recipients can join Chicago Detours' mostly indoor walking tours, which run year-round and create memorable and educational experiences. Tour options include the "Loop Interior Architecture Walking Tour," available seven days a week, the "Historic Chicago Walking Bar Tour," available most evenings, and the "1893 World's Fair Tour with Bars," which runs on Wednesday, Friday, and Saturday. Gift cards are can be bought at the following values: $25, $35, $50, $75, $100 and $200. All public tours have additional times scheduled between Christmas and New Year's, too. Gift recipients can ring in the New Year with a Historic Bar Tour on the evening of January 1 as well! Another excellent gift option is to book "A Holiday Tour of Drinks, Daleys and Dead Guys." This nostalgic, fun and distinctly Chicago holiday tour stops for adult beverages and explores both classic and off-the-beaten-path sites and stories. For example, guests will discover how Mayor Richard J. Daley saved the Christmas Parade, and then how his son, Richard M., was almost given a stocking of coal for his affront to Christmas and Hanukkah! "A Holiday Tour of Drinks, Daleys and Dead Guys" has been selling out, and still has a few tour dates left through Dec. 30. 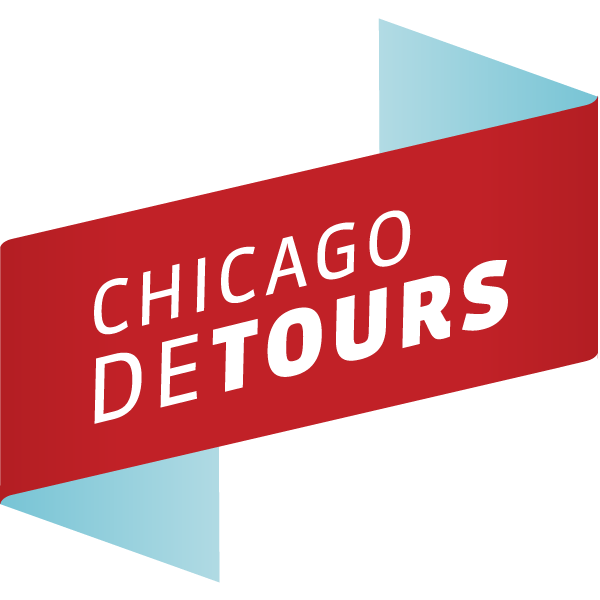 Tour details and available times are on the Chicago Detours website. Finally, to help you find the perfect last-minute gift for that Chicago-loving friend or relative, we rounded up our favorite local gifts in the "Chicago Holiday Gift Guide 2017." From skyline socks to Wrigley Field-scented candles, you'll find the best gifts for Chicagophiles in this guide! Chicago Detours offers guided tours of the city's architecture, history and culture that bring people to explore stories and places locals don't even know. It is staffed by a passionate team of educators, historians, artists and storytellers, and is proud to be one of very few tour companies in Chicago that is rated five stars on both Yelp and TripAdvisor. We invite you to enter the 2018 Edition of the Siena International Photo Awards, which is dedicated to the best photographers from all over the world. Our international jury will select outstanding photographers - from all cultures, all points of view, with no age limit. This will be a wonderful chance to be selected as exhibitor at the Siena International Photo Awards Festival. Awards will include the coveted Pangea Prize, the participation as Special Guest at the Awards Ceremony which will be held at the awesome Teatro dei Rozzi located in Siena, the exhibition and the inclusion in the annual upcoming photobook "Beyond the Lens". Don't miss this opportunity to expose your work to a global photography community of over 1 million. The winners will be announced June 10th, 2018. Enter your contribution today! The winners will be featured on hundreds of the most popular and prestigious international publications. Last year the winners were published on more then 300 magazines, websites and newspapers all over the world, included The Figaro, The Guardian, The Times, USA NPR National Public Radio, Lonely Planet, Der Spiegel, GEO-Foto, Daily Mirror, DigitalPHOTO-Magazine, El Pais, Digital Photo, reaching a coverage over 1 million people. The winning photographs and the honorable mention images are collected in the precious large format photo books with the hardback cover. A journey through creative images with a strong emotional meaning and of indisputable artistic value illustrate scenes of life, memories and travel adventures, a roundup of glances and people expressions, distinctive sports actions as well as fantastic stories related to nature, wildlife, landscapes, the environment and the cultural value of food worldwide. The winners are presented with the "Pangea Prize" during a spectacular evening at the gala ceremony in Siena. Enter for the opportunity to exhibit your work in Siena, be seen by photography industry insiders and have your work showcased at Siena International Photo Awards Festival. Randy Olson - The migration of Sandhill cranes gives Randy Olson the title of Photographer of the Year SIPAContest 2017. The author is best known for his collaboration with National Geographic magazine. Ami Vitale - Double recognition for the American photographer and director. She won the first prize in the Storytelling category, with the story "Pandas Gone Wild" and the prestigious award of Best Author SIPAContest 2017. January has been dubbed "Divorce Month,” and studies show more people file in January than any other month. According to experts, once the holidays are over and people face another new year, they take stock of their life and often come to the realization that their life has turned upside down. Since January is "the” month when married couples may seek an attorney to understand their options, here is a gift of support for anyone contemplating divorce; The Smart Gal's Guide thru Divorce: What Lawyers don't tell you by Sara A. This guide is proving to be a great resource to help on the complex journey through this often-painful process. This innovative guidebook has never been done before. With over sixteen chapters of 'smarts,' Sara guides women on how to become better informed. Chapters include Lawyering, Calendaring, Documenting, Protecting, Calculating, and Moving Forward, just to name a few. Sara helps women learn to control the costs, limit the losses, and preserve more of the family nest egg. Author Sara A. shares what she refers to as "Insider-thinking;” in other words, "What Lawyers don't tell you.” There are many books available that help women AFTER the divorce is done. But this book is different. This is a smart read that guides women on how to become aware of the pitfalls that can occur during the divorce process. Sara is a certified divorce coach. With a heart to encourage, in 2012 she founded Divorce Buddys, and in 2015 she expanded with her concept, G.O., Gals Only, a focused discussion setting for single women, connecting on foundational truths, faith-based inspiration, outreach and community. She is reaching her audience through TV and Radio interviews, Print, and Speaking Engagements, plus meeting with individual clients. For more information on Sara A. and her new book, please visit her social media sites on Twitter and Instagram. 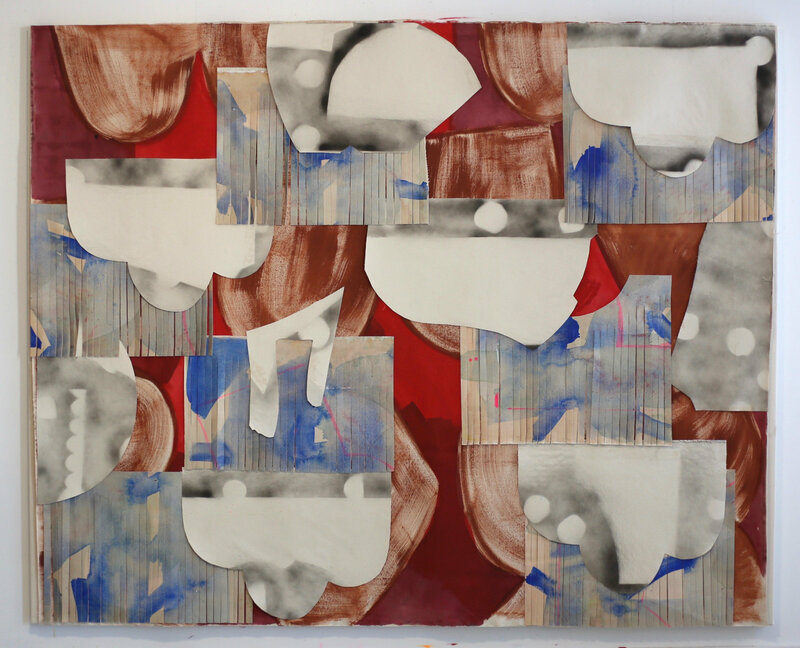 VICTORI + MO is a contemporary art gallery located in Bushwick, Brooklyn dedicated to developing and presenting emerging artists. Founded by Ed Victori and Celine Mo in 2014, the gallery has consistently served as a platform for artistic experimentation centered on supporting collaborative efforts to realize novel and ambitious projects, providing artists the freedom to transform the gallery to create immersive environments. VICTORI + MO’s program focuses on storytelling at the intersection of personal, social, and political narratives, promoting empathetic experiences that are relevant to life in an increasingly globalized community. In addition to nurturing artists and mounting exhibitions, the gallery also functions as a center for rigorous intellectual exchange, hosting dialogues, lectures, and other community activities. VICTORI + MO aims to transcend geographic and cultural boundaries by creating dialogue not only between the artists and the public, but across generations.